From American Banker June 24, 2010: With preferences for carrying and using cash continuing to drop, more consumers expect merchants to accept debit or credit cards for payment. But not all merchants do, especially those that lack physical storefronts. Some industry insiders believe mobile-based products might help encourage them to accept electronic payments. Indeed – Judging from the discussions among peers at recent industry conferences and the spate of mobile-based products and services entering the market, the topic is on the minds of many in the industry as they consider their business plans. Today, business owners on the go have more options, when it comes to processing credit card transactions, with smart-phone and cell phone credit card processing applications offering the potential for higher sales, faster collections and many fewer bad debts. Used with your smart iPhone, Blackberry, or Android phones, as well as Treos and other PDAs alpng with literally hundreds of cell phones and their carriers. In addition to the wireless telephone already in your pocket, there has been an explosion of ‘untethored’ credit card processing terminals. But which is better? Cell phones with card swipes or payment-software applications that run on smart phones? It depends, experts say. Hardware-based systems might benefit brick-and-mortar merchants because the hardware often can help speed up checkout lines. But mobile merchants may prefer software-based systems because they would not have to carry anything other than a phone when going to make a sale or accept a payment. In recognition of the obvious trend, 1st National Processing is now offering an innovative and cost-effective mobile payment processing solution. 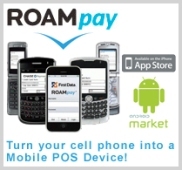 Partnered with ROAM Data to offer its ROAMpay software and hardware payment processing solutions that can be used with over 400 of today’s most popular mobile phones. Does Your Business Even Need a Wireless Credit Card Terminal? Is your business suffering because you’re unable to accept credit cards while on the road? Or worse, are you losing sales to declined credit cards processed off-location, without the customer or card present? If so, your business may need a wireless credit card terminal. Businesses may add additional applications to their end users such as order entry, inventory management, customer relationship management (CRM) and much more. With ROAMpay, business owner or company’s web services may be extended – turning cell phones into secure mobile PCs, and allowing a wireless workforce to process payments, update inventory, and access the company intranet from virtually anywhere. ROAM Data provides Level 1 support to all its mobile users. The application is PCI Certified and fully secure, with authentication of each device and each session, and 168 bit DES3 encryption for all data transmitted. For readers with a business on the go, choose wisely. You have many choices when it comes to wireless processing; it’s always best to explore many if not all of your options.